With popular games such as Fortnite and PUBG being released on smartphones, it gave players the ability to essentially game at any time and anywhere. But playing mobile games has one major caveat, the lack of exceptional audio. Playing video games on consoles or on PC gives us the benefit of using high-end gaming headsets that let us experience the games audio to its full extent, but how can players replicate that on their smartphones? 1MORE, a relatively unknown headphone manufacturer, knows that gamers aren’t really suited to bring their gaming headsets with them if they were to play games on their mobile devices. So they released the Spearhead VR Bluetooth In-Ear headphones, designed to give you immersive audio when playing video games on your mobile devices. The Spearhead VR applies the neckband design to keep your headset safely and securely on you while you’re using them. The neckband itself is comprised of a flexible silicone material that feels comfortable on your neck. The silicone material also stops the neckband from chafing the skin as the neckband rubs against your neck. At each end of the silicone band, you’ll, of course, find the housing units for the left and right channels. The left channel is where all the controls are conveniently placed, which is represented by only three buttons. The power button will allow you to not only turn on the headphones but also play/pause music and answer or end calls. The volume buttons are indicated by a plus or minus sign, so you can easily differentiate which button does what without looking at them, and they will also let you navigate through your music tracks. 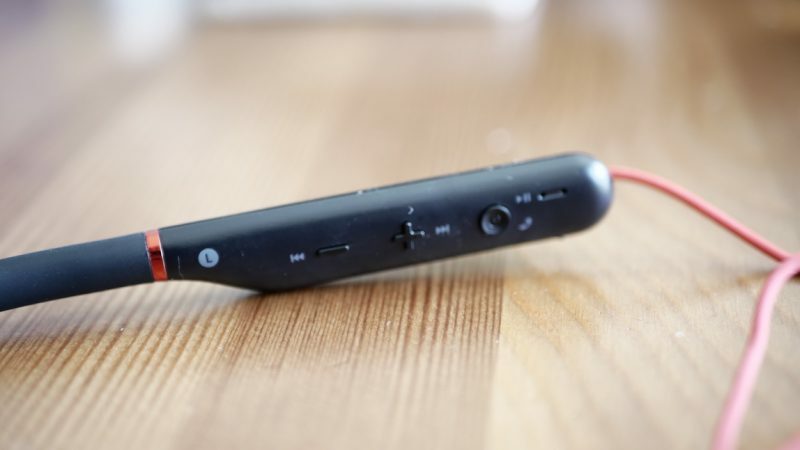 The left channel will also house the microphone and the micro USB slot for recharging the headphones. 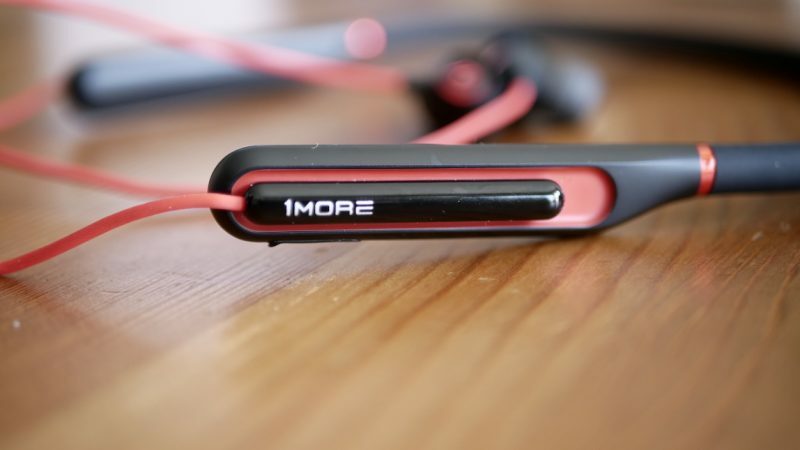 The earbuds themselves are attached to the neckband with an 8-inch cable. The length of the cable really helps by creating enough slack, so you can freely turn your head without the worry of having the earbuds being yanked out of your ear. The earbuds do have a comfortable fit inside my ear, which provided no discomfort even while wearing them for long periods of time. 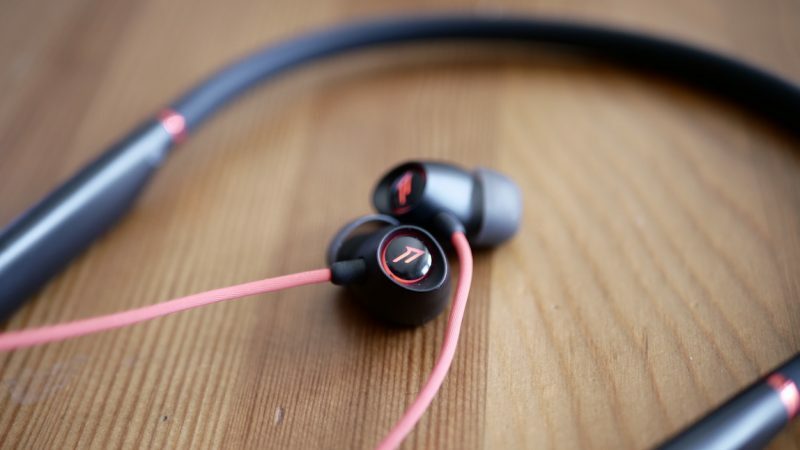 The outside of each earbud houses a small LED light that you can customize by using the 1MORE assistant app. The headphones use a dual-dynamic driver. One diaphragm is comprised of titanium, while the other utilizes a graphene composite. These two paired together opens the headphones up to an accurate and precise sound. While listening to music, the headphones produced some acceptable bass levels. Hip-Hop or EDM music will give you that thump and punch from the lows. It’s minuscule but still satisfying. The highs and mids are clear and dynamic enough, and at high levels, the headphones will produce some distortion but music will still be pleasurable enough to continue listening. Of course, where the headphones really shine is in video games. 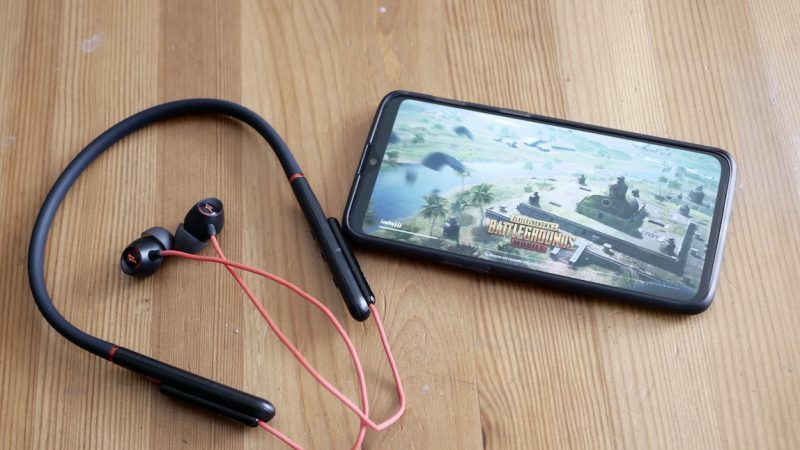 I played PUBG mobile while using the spearhead, and I was taken back on how great the headphones produced the games audio. Of course, the spearhead won’t replace the over-ear headsets I normally use while playing games on console, but for mobile games, the headphones exceeded my expectations. The spearhead gave PUBG’s audio some depth, which made it easy for me to hear footsteps and gunshots. It was fairly easy for me to dictate which direction the audio was coming from. Gunshots had a realistic snap and crack to them when they fly by you, as well as when you fire your weapons. To enhance the audio, the spearhead allows you to enable 1MORE’s virtual environment setting. This setting will give your headphones a 3D audio experience, which is geared more for your gaming. With the virtual environment turned on, gaming audio will be given a tad bit more substance to them, with the lows accentuated even more. The battery life on the spearhead is adequate enough to give you a good amount of gaming time. On a full charge, I was able to get around six to seven hours of usage time. A great feature the headphones had in regards to battery life was that at certain levels the headphones would play an auditory warning to let you know what your current battery life is. The headphones support quick charge technology, so a ten-minute charge will give you about three hours of battery life. For the serious gamers that want to take their gaming to mobile devices, the Spearhead VR Bluetooth headphones is a great companion that will give you good quality audio while you play your favorite games. Audio has a sense of deepness and realism to it that gives games a satisfying level of immersion. The battery is big enough to give you an ample amount of time for gaming, while the quick charge can let you jump back into your games with just a few minutes of downtime. Using the spearhead for music will also give you great overall sound, but there will be some noticeable distortion when you start to use higher volumes. There is no support for LDAC for HD audio streaming and the headphones still incorporate micro-USB. Overall, the Spearhead VR Bluetooth in-ear headphones are a great pair for gaming, movies, and music.